Selected from our stunning hand-crafted range of Garden Buildings, this large timber garage was recently installed for a customer based in Kenilworth, Warwickshire. Designed and hand-built to order at our Norfolk factory, the building was then delivered and installed by our in-house team of fitters. 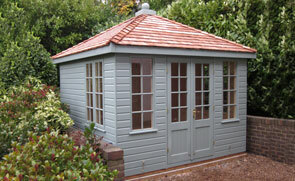 This stunning Wiveton Summerhouse was recently installed at a customer’s house in Lillington, Warwickshire. 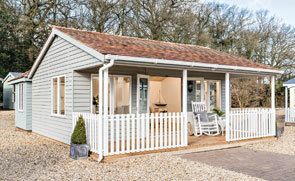 They opted for a convenient size of 3.0 x 3.0m and exterior cladding in FSC® certified timber shiplap. The exterior has then been finished off with our Valtti paint in Sage shade, which will not only retain its colour and finish for years to come but will also protect the timber from fungus and woodworm. 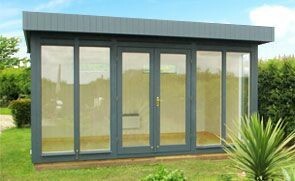 This contemporary garden studio-come-office was recently installed for a customer based in Warwick, Warwickshire. Designed and hand-built at our Norfolk factory, the building was both delivered and assembled at the customer's specified address by our expert, in-house installations team. Fabricated using only the finest FSC® certified Scandinavian Redwood timber, the customer selected the attractive building from our range of Garden Studios. This 2.4 x 3.0m Peckover Garden Shed was installed in a snowy garden in Warwick, demonstrating that our expert installation team can work in most conditions. 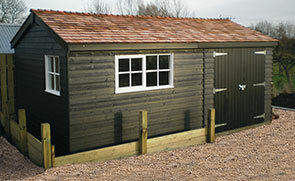 As with all our timber garden buildings, the shed was designed and built to order by hand at our Norfolk factory before being both delivered and installed by our in-house team of expert fitters at the customer's specified delivery address.